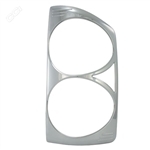 Chrome Tail Light Bezels from ShopSAR.com is made of the finest stainless steel polished to a chrome finish or abs chrome and is specially designed for the year make, and model of your vehicle. 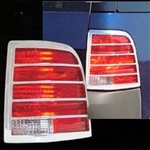 Sold in pairs, our tail light trim installs easily around your tail lights with 3M adhesive in minutes. No cutting, drilling, or modification needed. 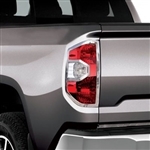 Chrome Tail Light Trim from ShopSAR.com matches existing chrome trim on your car as well as other chrome accessories including Chrome Mirror Covers, Tailgate Trim, and License Plate Bezels, all sold separately. 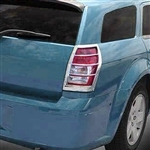 ShopSAR.com features Chevy Silverado Chrome Tail Light Trim, Lincoln Navigator ABS Chrome Tail Light Bezels, Dodge Ram Chrome Taillight Covers, as well as for Ford Mustang and Lincoln MKC chrome tail light accents. These bright bezel sets give a high-end appearance inexpensively and with minimal effort. Custom designed to fit your specific year, make and model for a no hassle perfect fit! 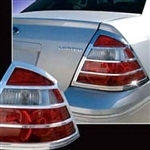 Simply clean the surface with the provided alcohol swab, peel the adhesive backing, then carefully place the trim over your factory tail lights.They are backed with automotive grade 3M foam adhesive tape for a permanent bond to last the life of your vehicle, no matter what the weather or how many car washes you subject them to.